The Mile Marker 73 & Highway 55 Fire near Gardena is now estimated to be 2,000 acres and growing. Idaho Department of Lands (IDL) together with the U.S. Forest Service, Garden Valley and Horseshoe Bend Fire Departments continue to jointly battle the fire that continues to burn uphill and to the east. A Type 1 Team will take over fire operations on Friday morning. Drivers are asked to avoid Highway 55. Those driving north to McCall or above are asked to take Highway 95. Those going toward Stanley are asked to take Highway 21 or go through Sun Valley. For those who must take Highway 55, it is reopened with a pilot car leading traffic, alternating directions using one lane with long delays are expected. There is the possibility of falling rock and drivers need to be aware of the possible hazard and drive with caution. Idaho Power has shut off power to Garden Valley while they replace damaged power poles. There is no estimated time for power restoration. 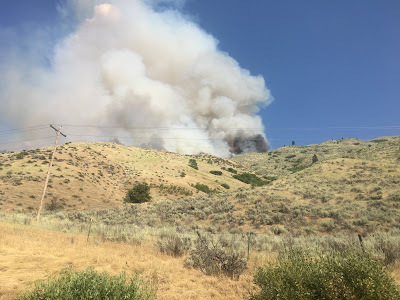 One helicopter, three Single Engine Air Tankers (SEATs), one Very Large Air Tanker (VLAT), one IDL engine, four Forest Service engines, several BLM engine resources, Garden Valley and Horseshoe Bend Rural Fire Departments are on scene. Two dozers and two additional crews have been ordered and will arrive today. The fire was reported Wednesday, July 25th, at approximately 4 P.M. The cause is under investigation. Photos taken by Boise National Forest Fire Prevention Technician Jessica Kearney-Reeves. About IDL Fire: 10 Idaho Department of Lands Forest Protective Districts and two timber protective associations are responsible for fire prevention and protection on more than 7 million acres of state and private forests and rangelands in Idaho. IDL fire suppression efforts focus on initial attack. The work of the IDL fire management program helps protect and preserve important endowment timber assets as well as millions of acres of private forestland. The program also enhances forest and rangeland management on state endowment trust lands by utilizing fire as a management tool, and protects local communities from wildfire by reducing fuels.